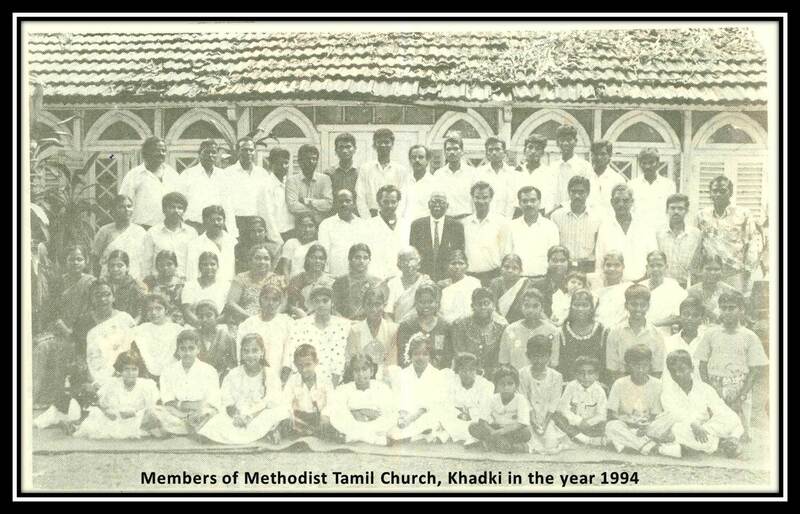 The Tamil Congregation of Methodist Church, Khadki had its humble beginning in the year 1961 and took a long way to become a well-established Tamil church today, called Methodist Tamil Church, Khadki. The congregation was started to accomplish the need of Tamil speaking people to have their worship services in their mother tongue, who were earlier attending the worship service with the members of English congregation. The worship services in Tamil language were initially conducted by Mr. G. A. Samuel, under the co-ordination of English congregation. After Mr. G.A. Samuel, the services were conducted under the leadership of Hav. David and Mr. M.K. Ethurajan. As Hav. David left Pune for his field service, Mr. I. Marc took over the leadership charge and was assisted by the then active members like Mr. M. K. Ethurajan and Sub. D. J. Barnabas.In the absence of a regular pastor, during this period, the Holy Communion services were solemnized by Rev. E. E. James. With the good spirit and enthusiasm shown by the prayerful leaders, God helped the congregation to grow in number day by day. In 1964, the Tamil congregation requested the then Bishop to organise a separate Quarterly Conference for the Tamil congregation. As a result, under the chairmanship of Rev. J. B. Satyavarata, Dist. Supt., the first Quarterly Conference was inaugurated and Rev. Charles Salins, who knows Tamil, was given charge of the congregation. During the late 1960s and through 1970s Mr. J. Z. Selvaraj assisted Rev. Charles Salins and then Rev. Martin. In the absence of these pastors, Tamil pastor Rev. Justin Harris used to come from Bombay to conduct the Holy Communion services. In the year 1983, the church got a full time pastor. Rev. Samuel John Royappa was the first full time pastor of the church. During his tenure the church took a new shape, and started functioning in a well organised manner. With the addition of many new members the congregation became a full fledged church. In the year 1989, Rev. Christopher Raja, took over the pastoral charge and he served till May 1992. From the year 1992 to 1997, Rev. J. Prince was the pastor-in charge. Under his able leadership, the church took up out-reach ministries in Bopodi, Dapodi and Nigdi areas. The outcome of Nigdi outreach ministry was the establishment of a new church in Nigdi which is presently known as Elim Methodist Tamil Church, Nigdi. Rev N. Lancer took over the Pastoral Charge in 1998 and he served in the church till 2002.Then Rev. C. Selvin took over and he served the church as pastor from 2002 to 2006. From 2006 to 2009 Rev. John Peter served as pastor.During this period, the Methodist organizations like MYF, WSCS, MMF and Sunday School started functioning actively. From the year 2008, the church started supporting missionaries. The first missionary support was provided to a Church Growth Missionary Movement (CGMM) missionary in 2008 and in 2009 a Friends Missionary Prayer Band (FMPB) missionary was supported. During 2009-2010 Rev. T.D. Johnson was the pastor for a short period and from April 2010 - September 2014 Rev. N. Lancer served as pastor. During this period the church started supporting 3 more missionaries and 5 tribal children. Also the church has seen a historic event of Missionary Field Visit to Gujarat in the year 2011. A few pioneer members of this church are Late Mr. Selvaraj, Late Mr. V. Koilpillai, Late Mrs. Mary Jimmy Thomas, Mr. Simon J. Thomas, Mr. Kanagaraj, and Mr. Wilfred Luke. God Almighty has been faithful to this church over the years in building His kingdom. Today, the church has grown spiritually, financially and numerically fulfilling the purpose of its institution and harvesting the labor of our predecessors. Let God’s name be glorified and His will be done through this church till the second coming of Jesus Christ.